What a great way to use the last bits of fresh herbs ~ rosemary, sage, thyme , chive and parsley ~ harvested (snipped, in fact) from the garden! This was just delicious! The potatoes were heirloom German Butterballs (the November issue of Food & Wine says, "If you like Yukon Gold potatoes, try German Butterballs. Their luscious yellow flesh and adorable name might make them the next hot potato. Chefs from Rick Bayless to Loretta Kelloer are featuring these little heirlooms, which range from golf ball- to fist-size") from the wonderful St Paul Farmers Market so it's only right that the inspiration came from its recipe section. My new foodie friends tried other varieties, Kate in the Kitchen tried the Rose Finn fingerlings (in soup) and Laura from My Sister's Kitchen tried the Peruvian Purple Potatoes (roasted with other root vegetables). We all loved them! My now-second visit to the St Paul Farmers Market makes me realize how little variety, really, we have available in our St Louis-area farmers markets, my own Kirkwood Market, Soulard Market, the Central West End Green Market, the Tower Grove, Maplewood and even the protein-heavy Clayton. Why is that??? NEXT TIME ... to save a dish, I'd drain the water and do the oil/garlic/herbs in the pot used for steaming rather than a separate skillet. FROM THE ARCHIVES ... For other potato recipes, see here in the Recipe Box. Place 1 - 2 inches water in the steamer, set to high. Add the potato pieces, cover and let cook until soft, about 15 minutes. In a skillet (or the still-hot, drained pot used for steaming), heat the olive oil til shimmery. Add the garlic and cook for 1 minute. Add the fresh herbs and the cooked potatoes. Season to taste. Toss until potatoes are warmed through and just beginning to brown. Toss with fresh parsley and serve. Great photo. This does sound delicious. No potatoes on South Beach though. Sigh. The remaining Rose Finn potatoes ended up being roasted with yams, and were SO delicious! Simple and deliciously scented. Love it! Kalyn ~ Thanks! I love the photo box you posted about. This was photo #2 when I learned how to turn on the spot lights! Kate ~ Three cheers for Minnesota potatoes! Jeff ~ OK! Skip it if you prefer! Bea ~ Ah yes, the aroma of fresh herbs. Oh, this is fantastic! I brought my sage and rosemary plants inside for the winter -- big ol' things they are. I must make these right away. Sounds simple to make and big on flavor. 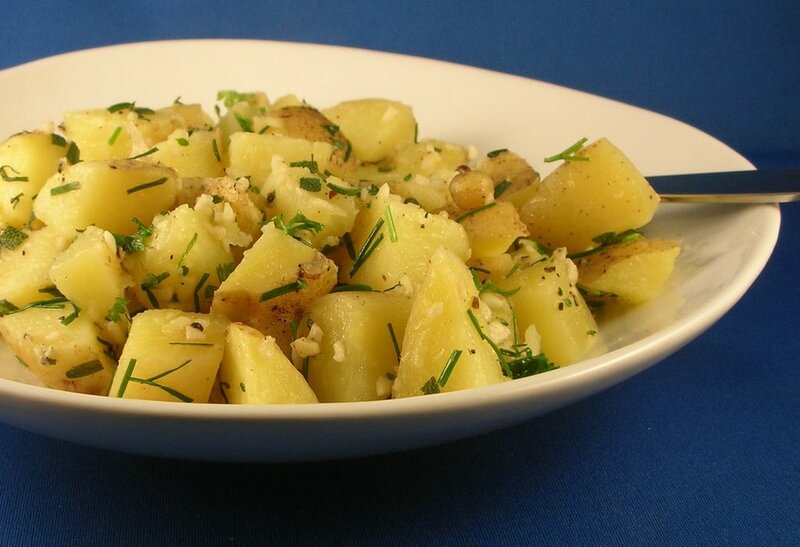 Love potatoes that have herbs mixed in with them. It adds so much more to the aroma.